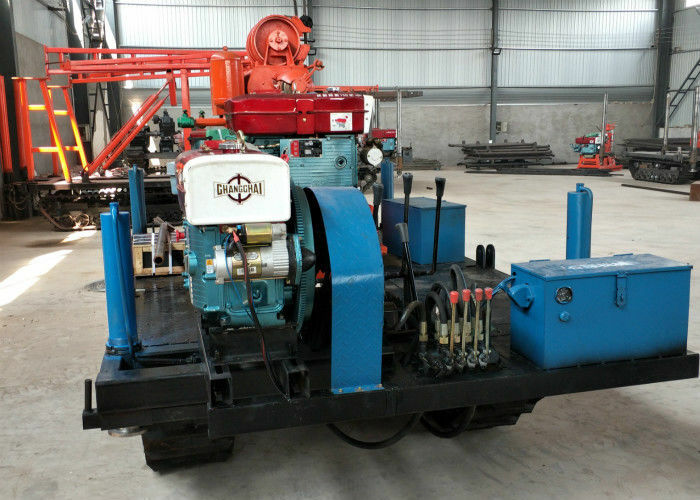 Hydraulic drilling rig is a new type of core drilling rig which is developed especially to meet the need of various drilling process mainly in diamond drilling, the power machine of which can be either motor or diesel engine. 1). The drill can meet the various high efficiency drilling process requirements such as the diamond cable, concussion turning, orientation drilling and reverse circulation core-drilling. 4). Large engine power and two reverse rotation gears, can easily solve the drilling work accident. 5) The operation handles are fixed together in reasonable layout to make it more convenient for workers to operate the machine. 7). Spindle and hoist can be operated separately. 8). Spindle has big inner diameter, able to use big hexagonal drilling rod.